How to master advanced bracing techniques, and the kayak roll, without having to get cold or even get you hair wet practicing. Picture in your mind how much more skilled a kayaker you will be once you finally keep your neck and head warm, so you can relax when you roll. Plus: Now that you can do so in comfort, imagine practicing every time you kayak, instead of being limited to a few pool sessions a year. I can remember paddling into a quiet and hidden cove to practice my bracing and rolling. Hidden because i was embarrassed at how clumsy I was in the kayak, and how long it was taking me to develop simple skills that I now teach people in 10 minutes or less. I would put on as many layers as I could under a dry top, and try doing a balance brace, with a paddle float at the end of my paddle, and i would still get pushed under by the kayak, and find myself having to do a wet exit. Of Course some water came in, and even though i was wearing a 5mm thick diving hood on my head, i lost so much heat that i became dangerously close to hypothermia in less than 20 minutes. I decided that i needed a dry suit. and what surprised me is that i still got cold. Plus putting on that neck gasket was torture for me. Paddling in this outfit was so uncomfortable it took all the fun out of kayaking. I thought there had to be a solution. And after searching I realized there wasn't anything on the market for a kayaker who wanted to be comfortable kayaking all day, and be just as comfortable taking a break, relaxing into a balance brace, and doing a few rolls, and then keep on paddling. This is a System that allows ordinary kayakers to rapidly develop their skills. Because now that you can be comfortable in the water, you can relax. And all of a sudden doing a balance brace is easy, because relaxing gives you the flexibility you need. Plus learning to roll comes naturally when you can relax into a balance brace almost every-time you go for a paddle. And now, you can experience this same success for yourself, using this proven protective clothing. The problem why it's so hard for us to learn outstanding bracing and rolling techniques is not because of a lack of natural athletic ability. It's really not your fault that you can't remember what to do when immersing your head under water gives you instant Cold Shock followed by an ice cream headache. You may have heard, or perhaps even believed at one point, that if only you had a dry suit you could stay warm and relax even with your head under freezing cold water. And you know what? It doesn't work at all. So many of us got a dry suit believing that it would allow us to get comfortable and relax under water. We thought it would allow us to painlessly practice our bracing skills and rolling skills. 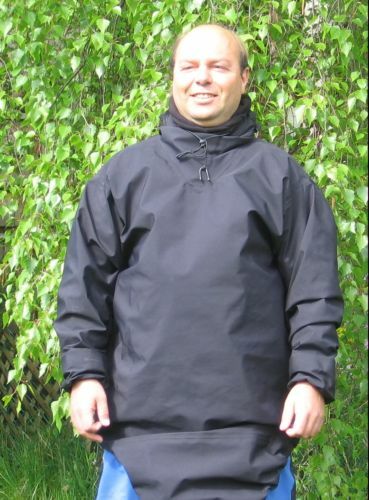 It just doesn't work because a dry suit doesn't protect your neck or your head from the cold water. And if you want to bring out your full flexibility you need to be able to relax, and stay warm. The TRUTH is that without complete neck and head protection you can't feel comfortable with your head underwater, and this is the biggest obstacle holding you back from being the bracing and rolling expert you want to be. Without the right gear, you are left practicing rolling in the pool, a few times a year. In conditions that are in no way similar than those you will find yourself in when capsizing in real life. Now that you know the problem…that your rolling skills have been held back for years due to these limitations in your kayak gear. First, you absolutely must avoid cold water on your head and neck. And wearing a neoprene diving hood like I started with will not do. You will not be able to or willing to practice doing a few braces every time you go out paddling. Why would you want to be wet and cold for the rest of the trip? And without regular practice you simply can't develop the same expert like kayak control that you could be enjoying if you were staying dry and comfortable. Just by keeping your head and neck protected you will see your skills jump to the next level. Imagine: You can now relax into a balance brace several times and every time you go kayaking. You can do a few rolls every time the group stops for a break, so that your skills are always staying fine tuned, and even improving. People will look at you in amazement as you roll and brace like an expert, even if you have been kayaking only for a short time. Now, how would you like to actually ENJOY learning to brace and roll like the elite kayaker? Many folks believe you have to force yourself to practice rolling. They want the safety of having a bombproof roll, but practicing is just plain painful. Up until now. Just picture it: You go for a short paddle on a beautiful day, you stop in a nice cove, and after relaxing into a balance brace for a stretch, you decide to do a few rolls to cool off, or just because you feel like it. Your friends will be STUNNED when they see you effortlessly achieving such an elegant and effortless roll when they still act as if rolling is a scary thing that you only do in the pool. Not only that, now that you are comfortable rolling, you feel confident when the wind comes up and you end up having to go through some rough water. Enjoying the journey is the key to staying on the path, and this simple piece of gear will get you there fast! All while you 'magically' develop expert like kayaking skills fast, you can now paddle all day in comfort. You can now look forward to the wind, and spray in your face. Because now that your neck and head are protected by a completely windproof and waterproof hood, you can paddle in the freezing cold spray and stay toasty warm while doing it. I think you'll agree that I covered some really key needs that you must meet if you want to develop your kayak skills fast. Choice 1: Continue trying to achieve advanced kayak skills without the gear that was specifically designed to make it a snap. Who knows? You may do just fine without any extra gear than what you already have. Or, consider the wiser choice Choice #2, which will ENSURE your learn to brace and roll much faster. Based on a time tested, proven, and efficient Inuit design, but made of the same waterproof/breathable material you find on all the respectable top quality dry tops. And speaking of encouraging flexibility. One of the most crucial advantage of the tuilik is that the skirt is attached. without having a skirt that uncomfortably squeezed your torso, and leaves you sweaty underneath. You will find that with no holes above the skirt for water to get in, your kayak now stays a lot dryer when you take on water from larger waves that wash over board, or when you do a lot of rolling. The success of the Greenland style rollers can now be duplicated by you. With gear that is not limited to rolling practice. To give you the most comfortable experience whether you are kayaking or rolling or both. So, if you're wanting the REAL ANSWER to developing outstanding kayak skills, and you want to be comfortable paddling so you can get the most pleasure from your trips. Then The Comfort Paddling Tuilik may be the solution for you! "It fits perfectly and I tried it on the water doing a few rolls, sculling supports and braces. I was completely dry and did not even get my hair wet!"